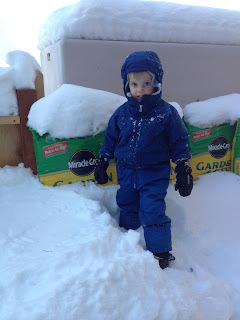 My poor kids tend to not get much "outdoor" time in the wintertime. Mostly for the fact that I find it too cold and too much work to try to get them all bundled up. But, we did get a sledding disc from Aunt Katie when she was here and it has been the new favorite toy in the backyard. 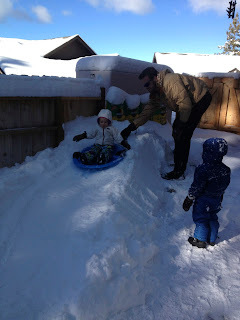 After our last big snow, Joe built up a sledding hill that is manageable for a 3 and almost 2 year old to sled on by themselves. We have had lots of laughs and fun on it!